Each crock holds a stick or two of butter. 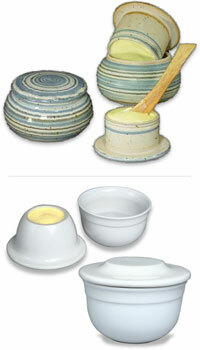 You pack softened butter into the bell-shaped cup, then pour cold water into the base. The lid is placed upside down back into the base. The water creates an airtight seal that preserves the freshness of the butter while keeping it at room temperature. The secret to keeping your butter fresh and spreadably soft is to keep a butter crock on your counter. Before the age of refrigeration, butter was often kept in earthenware pots large and small, sometimes submerged in water. The modern water-submerged butter crock is thought to have first appeared in France in the Middle Ages, and many (not all!) French have been using them since. Such crocks are recently being rediscovered by people who want soft butter. Crocks keep butter fresh at room temperature (up to about 80° F) on the counter for several weeks without spoiling. At higher temperatures, the butter may slip out. This is better than a refrigerator because the butter is protected from the air, and it remains at room temperature. It won't tear bread and is easy to measure. (in French, Le beurrier, Le Beurrier Breton; in German, butterdosen).